COLLEGE STATION, Texas (AP) — A service has been scheduled Aug. 30 at Kyle Field to remember late Texas A&M collie mascot Reveille VIII. 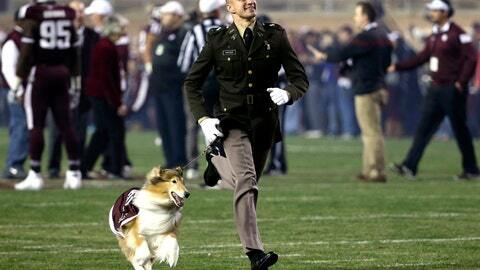 In 2014, then-A&M cadet handler Ryan Kreider deflected an SMU wide receiver from the dog. Kreider threw himself in front of the out-of-bounds player. A&M went on to win that game 58-6. Kreider has been invited to attend the service this month. The Aggies host Northwestern State the same day.